We had a significant snowstorm March 14. My work was closed so I got to go out and paint in it. I'm wearing my new snowshoes. So far, I haven't ventured far from home to paint in a snowstorm - to drive would be foolhardy, and I'm still a beginner on the snowshoes. But in near whiteout conditions, one place looks pretty much like another, so it's all good. 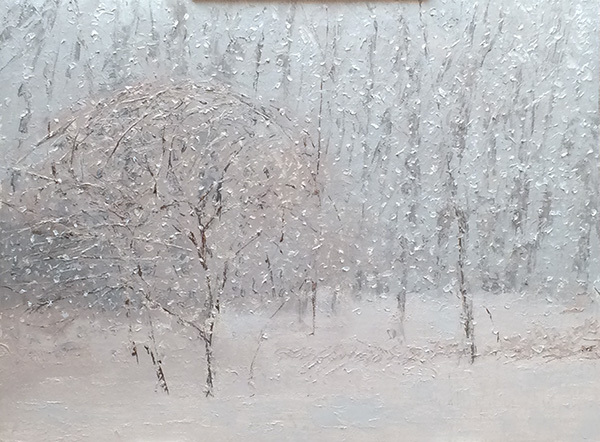 I noticed that the falling snow picked up the colors of the surrounding scene, giving a slight color cast to the flakes in different parts of the scene. I tried to convey that with paint, varying the warmth and coolness of the colors. I'm using a very limited palette of venetian red, phthalo blue, and white. 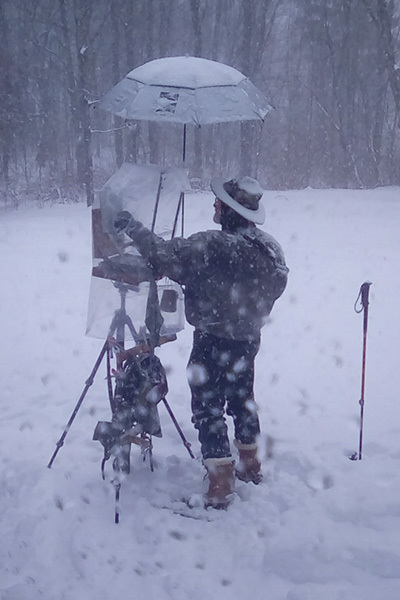 As I painted I sang "Snowy, snowy day, paint your palette blue and gray..."
Painting in the snow - more flakes!